Expecting Rain • View topic - Favourite concert intro? Post subject: Favourite concert intro? Of course the NET intro from a few years back "fell into a haze of substance abuse" ect is the best into ever! But i wondered what are the people on heres favourite? Sometimes it can make a song, a concert or even a tour leg that bit magical. Crowd reaction of course has something to do with it too. I love the italian? Womans voice that introduces bobs performance in bologna, before he met the pope. Bob deeeeelan. Bobs intro for bruce, rock and roll hall of fame is a laugh too. Let me hear you say broooose. "you know him, hes yours" from the 60s, newport maybe? I find cringeworthy, i cant imagine blob would have been pleased by that one. Post subject: Re: Favourite concert intro? I quite like Stu's acoustic bits and also the classical music they used to play on the PA - I think it was Aaron Copland! I liked the Kansas City intro, where Bob opened with Kansas City. Or was it San Francisco Bay Blues..The announcer says something along the lines that Bob Dylan is his favorite singer/songwriter before Bob comes on stage. ^Tonight I'll Be Staying Here With You was never the opener during the RTR. I never cared for the lengthy intro, I like the Foggy Dew noodle of the last few years. On intros, I thought the grammys 98 by, Kelsey grammer was the perfect tone for the song that followed. And dylans reaction, or lack of it, to soy bomb man that night was great. but the recent "Old Triangle"-intro is the best ever for me. "I'd Like to bring on a friend of us all - Mr Bob Dylan"
When was the old triangle used? What was Bob introduction on the last waltz? Was it just "ladys and gentlemen, Bob Dylan"? Bob comes on stage with the first chord of the song, a perfect start to a show. They've all been good for the time but I really like Stu's acoustic playing as an intro. Very understated and makes it feel as though some good theatre is about to unfold. Wasnt it something like we want to bring on a special friend of ours? Sometimes Al Santos (if I have the name right) would sound like he was about to crack up reading the "bed with rock" intro. For some reason it always makes me feel like the show would be something special. Sounds good, i dont think ive heard that before, what year/shows was this in? Does anybody know the show were Santos botches the intro a couple times and eventually gives up and says something like "Right here, right now, Bob Dylan!" Does anyone have the full transcript of the intro that mentions the £substance but emerged to find jesus, columbia recording artist?" In Spring 2005 the intro changed from night to night. From plain "Good evening Ladies and Gentlemen, Bob Dylan" to "The poet laureate..."
It surprises me some that Bob approved that intro. It contains pretty much all the ettiquettes that he is allergic to and that he always rejects when confronted by the press. The long-winded "...haze of substance abuse...", etc. one will always have a special place in my heart, because I just happened to be at the show in which it was first used. In Hamburg, NY. I can distinctly remember being there trying to make sense of it all as it was flying by in a blur. Like did I really hear all that??? 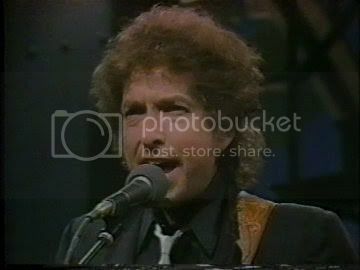 This standard intro for several years up to that night was "Good evening ladies and gentlemen, please welcome Columbia recording artist, Bob Dylan" intro, so there was no reason to expect anything else. This is the definitive one for me, for me it shows blobs dry humour, and was delived perfectly, unlike bobs musicares speech , but shsss. It's taken word for word from a newspaper blurb for that day's show. Somewhere there's a column where the author describes walking down the aisle slightly late and hearing his own words coming over the pa to announce Bob Dylan!